Image (click to enlarge): U.S. daily high temperatures, June 28, 2013, from Unisys. Note the bright blue area of 120°+. July 1 Update: The 129° at the aptly-named Furnace Creek in Death Valley on June 30 was a new all-time June high temperature record there. The previous record of 128° was set on June 29, 1994 and tied on the same date this year. The June 30 reading also tied the all-time June record for the U.S. which was originally set 111 years ago on June 23, 1902 in the former town of Volcano, California. The June average temperature of 101.3° at Death Valley easily surpassed the old June record of 100.4° in 1960. The June average daily minimum of 87.1° also set a record, exceeding the 86.8° in 1977. June 30, 5 PM PDT Update: As of 5 pm, Las Vegas is reporting a high so far of 117°, which ties the all-time record. The preliminary monthly average of 91.5° smokes the old June record by a full degree. June 30, 4 PM PDT Update: The current temperature of 116° at Las Vegas ties the all-time June record set on June 15, 1940. This is the third consecutive day of 115°+ at Las Vegas. Phoenix tied its record for June 30 at 115°. - The 115° at Las Vegas tied the record for the date. - Needles, California hit 123°, which set a new all-time June record in a climate history extending back to 1888. - Kingman, Arizona beat its old June all-time high by 2° in a climate record which began in 1901. - Salt Lake City had 105° for the second consecutive day. This was a new all-time June record. June 29, 10 AM Update: The National Weather Service has provided additional record reports for Needles and Death Valley, California and Kingman, Arizona, included in the table below. The 115° at Las Vegas was the first time that level was reached in June since 1994. It was also the hottest June temperature at Needles since 1994. At Kingman, it was the second earliest 110° temperature; the earliest was June 16, 1917. That also ties the all-time June record. It was historically hot in the desert Southwest today. Over a dozen major National Weather Service climate locations in Arizona, Nevada and interior California tied or broke temperature records for June 28, in some cases by big margins. The highest readings in absolute terms were 118° at Palm Springs, California, which tied its 1979 record, and at Yuma, Arizona. Yuma climate records began nearly 140 years ago, in 1876. The previous record of 116° was tied 3 times, but it was soundly broken by a margin of 2°. At Winnemucca, Nevada the previous record of 101° was set just 3 years ago in a climate history which dates back to 1877, but this was surpassed by an impressive margin of 4°. 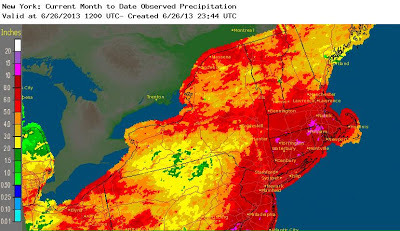 June 27 (Thursday), 10:30 PM Update: The 0.23" so far tonight brings the monthly total to 10.09", which surpasses the 10.06" in 2009 as the second wettest June on record. The 0.05" of rain which fell at New York's Central Park in light showers this evening brings the month-to-date total to 9.86". This puts June 2013 firmly in position as the 3rd wettest June in a climate history which extends back to 1869. Less than half an inch now separates the current month from the June record of 10.27" in 2003. With over 1" of rain forecast for Thursday and Friday (June 27-28), the record is well within reach. The 3 wettest Junes in New York have now all occurred in the past 11 years. The all-time wettest month was August 2011, when 18.95" fell.